When the audio adaptor is connected in a system with other devices sharing the same power source, or even seprate power supplies with common grounds, a "ground loop" can be formed, causing noise to be heard related to the power supply currents. This ground isolator is a simple way to solve ground loop noise. Just plug it between the audio board and the line-in of your amplifier or other equipment. This device is bi-directional. Either side may be used as the input or output. Internally, it uses magnetic coupling to transfer your audio signal, while blocking DC power supply ground currents. The output should be connected only to impedance line-in devices (amplifiers, mixers, effects pedals, etc) for best results. Use of low impedance devices (headphones or speakers) will result in signal loss, especially at lower frequencies. An alternative way to isolate grounds uses a USB ground isolator. PJRC has tested this Hifimediy isolator with Teensy 3.x boards. 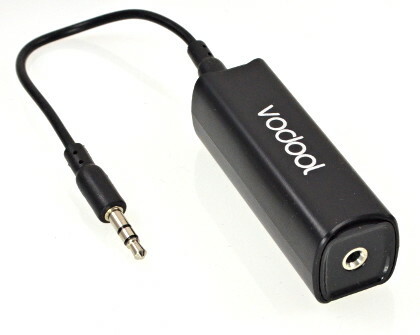 While more expensive, isolating the USB connection can avoid the need to pass analog audio signals through an isolator. However, USB isolation is more expensive.